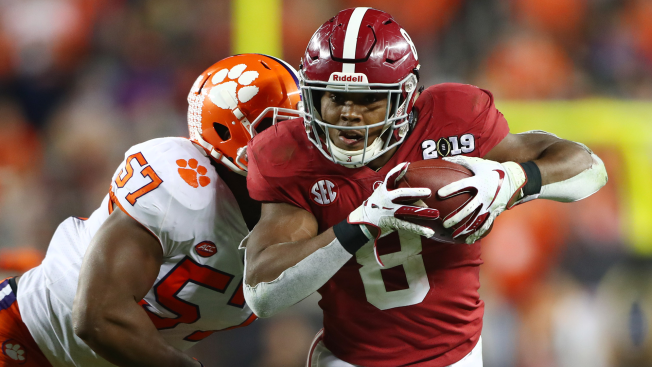 Considered by many to be the top running back in the 2019 class, there's a good chance Alabama's Josh Jacobs could be the only running back taken in the first round this year. Jacobs (5-10, 220) carried the ball 251 times in three years at Alabama for nearly 1,500 yards. He had a 5.9 yards-per-carry average and 16 touchdown runs. Eleven of those touchdown runs came in his junior season in 2018. Aside from his ability as a runner, Jacobs has also proven to be a quality receiver out of the backfield. He had 48 catches in three years for 571 yards and five touchdowns. Jacobs has the potential to become a true three-down back in the NFL and has what seems like a great combination of size, power, agility and athleticism. Current roster at RB: The Eagles traded for Jordan Howard, but Howard has just one more season under contract. From there, the Eagles also have Corey Clement, Wendell Smallwood, Josh Adams and Boston Scott. They could clearly use more help at the position. How he would fit: If the Eagles draft a running back in the first round, he's going to play a ton in Year 1 and become the primary running back early. Shelf life for running backs is shorter than other positions, so the Eagles would need to get as much as they can out of him while they can. With his ability and potential as a three-down back, he's good enough to make Doug Pederson rethink his committee approach. Eagles history at RB in draft: The Eagles haven't used a first-round pick on a running back since 1986, when they took Keith Byars out of Ohio State. They haven't taken one in the first two rounds since Shady McCoy in 2009.